This story appears in the Dec. 21, 2015, issue of Sports Illustrated. To subscribe, click here. But the numbers lie. Her tennis year was all internal discord and quelled revolts; Williams battled her body like never before. A cough and cold had her vomiting before and, for the first time, during a match: the Australian Open final, in January, which she won anyway. Bone bruises in both knees, the residue of 20 years of pounding, flared during the spring hardcourt swing and never subsided. Her focus frayed, her footwork suffering, she arrived at the French Open nursing a right elbow strain that would plague her unparalleled serve the rest of the year. The whole Serena Williams construct—intimidation, power, will—had gone oddly fragile. But she refused to buckle. Then, after gutting through three three-set matches in the first week at Roland Garros, including a third-round comeback over perhaps her toughest contemporary, Victoria Azarenka, Williams came down with the flu. Beset by chills, 101º fever and congestion, she could barely move, much less sprint after balls. Yet down a set and a break in the semifinal, Williams roused herself—from pitiful to pitiless—and won 10 straight games to crush Timea Bacsinszky 6–0 in the third. At times, then, it became almost easy to forget Williams’s ailments, to marvel not just at her relentlessly lethal strokes and serve but also at the pure physicality that has pushed the women’s game to a level unforeseen by Graf and certainly by Margaret Court, who holds the Grand Slam record of 24 singles titles. But after that French semifinal Williams’s family found her curled up on a bench in the locker room, covered in towels and sobbing. 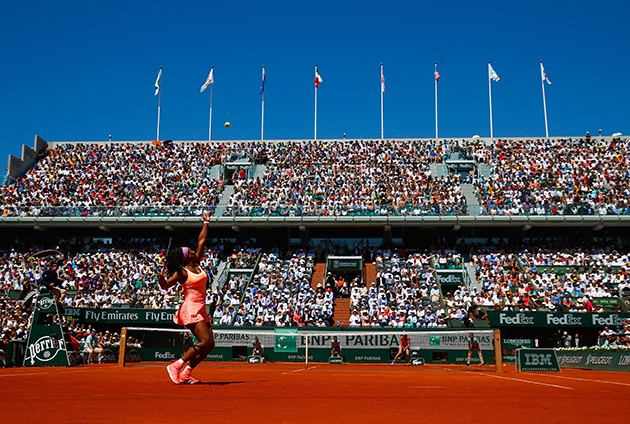 Roland Garros was the 59th Grand Slam event of her career; her mother had never seen her so physically shattered with a major singles final looming. “It was heartbreaking,” says Oracene Price. Exactly the thought of the other women on tour. 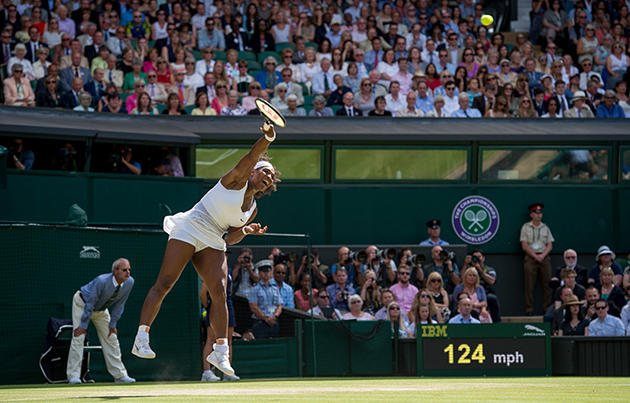 The following month Williams, aching but no longer ill, danced through the raindrops at Wimbledon, surmounting a two-break third-set hole against Heather Watson in the third round (“I was on my way out,” Williams says), dodging Azarenka over three sets in the quarters and bludgeoning Maria Sharapova, soon to be the No. 2 player in the world, in the semis and rising star Garbiñe Muguruza in the final. 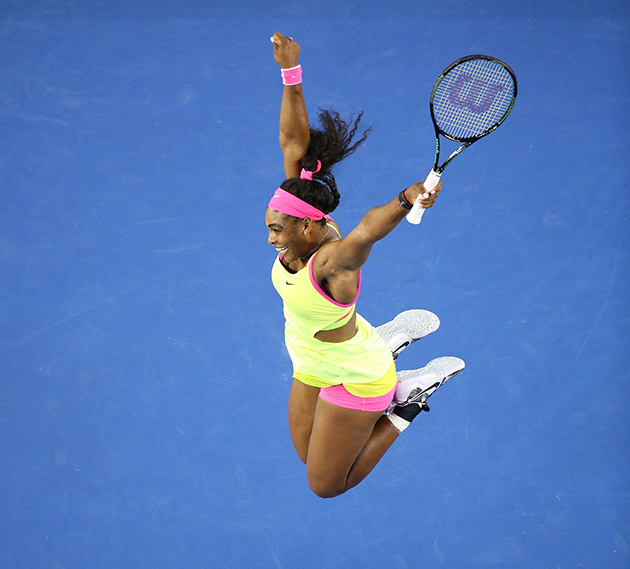 For the second time in her career, Williams had won four straight majors over two seasons: the Serena Slam. Now the oldest woman in the Open era to win a major singles title, she was ranging the tennis landscape like some sci-fi force cooked up by James Cameron and Nick Bollettieri: wounded, hunted yet adapting to every new adversary. All year Williams kept coming, on a path more arduous than anyone knew, and she put together the best season by a woman in a quarter century. “I do want to be known as the greatest ever,” she says. To many she already is. But that’s not the sole reason why we arrive, now, at this honor. It’s also because Williams kept pushing herself to grow, to be better, and tennis was the least of it. The trying is what’s impressive. The trying is why we are here. The first hint that this might be a different Serena Williams in 2015 came in Melbourne, during the Australian Open final. Blasting 18 aces and sharp off the ground, she produced perhaps her cleanest performance of the year, yet Sharapova still made her labor. Serving at 3–all, game point, in the second set, Williams cracked a seeming service winner and screamed “Come on!” even as Sharapova blocked the ball back. The chair umpire called hindrance. She docked Williams a point. The last time she received such a penalty, in the 2011 U.S. Open final, Williams lambasted the official (“Are you the one who screwed me over last time here? . . . Don’t look at me. . . . If you ever see me walking down the hall, look the other way”), lost focus and lost the match. She had also lost two years earlier when, on match point in the U.S. Open semis, she infamously threatened a line judge over a foot-fault call, incurring a record $82,500 fine. This time? Williams wiped her face and, two points later, ripped a forehand winner. She celebrated with a slow fist pump and a sardonically soft “Come on.” Then she fired another ace. For those who think that’s hardly enough to justify an award that for 60 years has emphasized an athlete’s “manner,” consider the fact that profanity never disqualified a male candidate (cough, Tiger Woods), that microphone technology has improved greatly over the decades and that the only safe pick might be a champion like American Pharoah (page 144), who may well be cursing in a language you don’t know. Besides, taken in the long continuum of tennis bratitude, 10% is no small amount. Since joining forces with coach Patrick Mouratoglou in June 2012, Williams has been calmer, more circumspect with officials and more gracious to her opponents. And, this year, she brushed aside justifiable rage and fear of public humiliation—not to mention a point of family honor—to address the darkest chapter of her career. 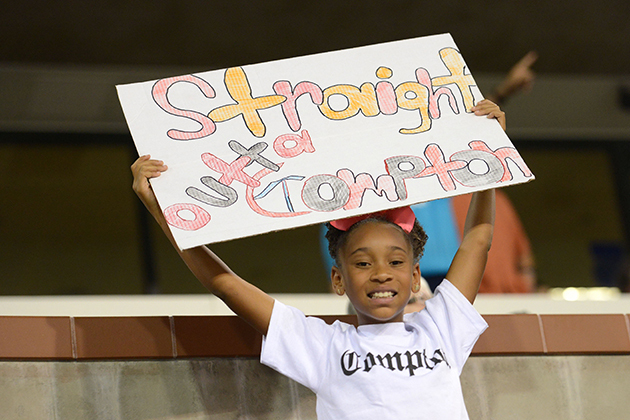 That was the second sign of a new Serena Williams. Four days after winning Australia she announced in Time that she would return to Indian Wells, a premier tour stop in California where, in 2001, unfounded rumors of a Williams family match fix sparked unprecedented ugliness. When Venus Williams, who had pulled out of her semifinal against Serena with a knee injury, appeared in the stadium with her father, Richard, for the final between her younger sister and Kim Clijsters, vicious booing ensued. Richard later claimed that he heard racial slurs, and TV cameras showed him shaking his fist at the crowd. Trophy in hand, Williams rode the two hours home to Los Angeles in tears. She begged her parents not to make her go back to Indian Wells, and no one in the family tried to—despite 13 years of questions, the threat of fines, the lost winnings and ranking points. At best Indian Wells served as an example of hostile relations between the U.S. tennis establishment and two of its greatest stars. At worst it became the WTA Tour’s open wound, revealing simmering tensions in a sport that had long heralded itself as a pioneer in racial and sexual equality. But a few years ago, after Mouratoglou replaced her parents as her full-time coach, Williams saw a film about Nelson Mandela and began to reconsider. She almost played Indian Wells in 2014 and backed off, but over the next year she approached her parents and three sisters, one by one, about a return in ’15. She went through three drafts of her Time essay, took one to her dad last fall and choked up trying to read it aloud. Finally she just handed it to him. Hardly anyone in the family loved the idea. 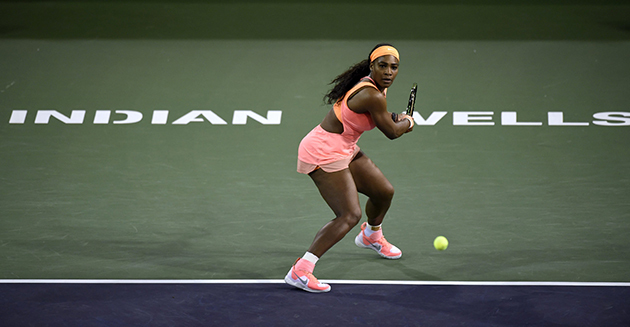 Venus and Richard weren’t ready—not yet—to accompany Serena to Indian Wells. “I wouldn’t have gone back,” Oracene says. “Not because I didn’t forgive them—because of my own integrity. If they didn’t think I deserve to be there? Then I don’t need to be there.” The fact that Indian Wells organizers invited the Williamses back every year—and that the boos had come from fans irate at not being able to see the sisters play—had nothing on the hostility that the family remembered from that day. On Nov. 30, five St. Louis Rams players took the field in a “Hands up, don’t shoot” display reminiscent of the gloved fists of Tommie Smith and John Carlos at the 1968 Olympics. Black athletes were becoming more vocal. Williams had been slightly ahead of the curve; in 2000 she boycotted a tournament in Hilton Head, S.C., to protest the flying of the Confederate flag over the state capitol. But for a long time she had tended to view race matters with a cool, almost clinical detachment. It wasn’t until 2006, when Williams made her first trip to Africa and toured Ghana’s slave dungeons, that inequality became a more visceral concern. She revisited the continent often and financed the construction of two rural high schools in Kenya, a country where many girls drop out and marry by 14. Williams insisted that enrollment be at least 40% female. For now her schools serve 442 students, 54% of them girls. This year’s senior class at the secondary school in the village of Wee included two boys who qualified for college—a level that no student in the region had ever attained. In the U.S., meanwhile, Williams has financed four years of college education for six youths and is paying the bills for a dozen more. After viewing a TED talk by Bryan Stevenson, executive director of the Equal Justice Initiative—a Montgomery, Alabama-based legal organization that provides representation for prisoners, mostly black and poor, who might have been wrongly convicted—Williams decided to pair her return to Indian Wells with an appeal for support for EJI’s work. Since 1989 the organization has saved 115 men on death row from execution. No prominent athlete had endorsed its work before. 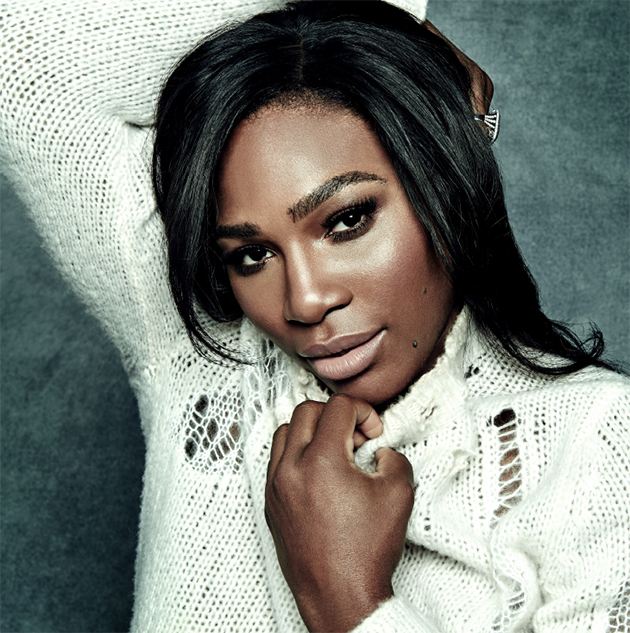 Offering up a hitting session, a souvenir racket and courtside tickets for her first match, Williams raised $100,000 for EJI; the attendant publicity generated $100,000 more in contributions. ​Still, by the time Indian Wells rolled around last March, Williams wasn’t feeling all that brave. Two days before her opening match, against Monica Niculescu, she had a panic attack in the bedroom of her L.A. home. I do not want to go there, Serena thought. What if it’s horrible? What if they boo again? How can I get out of this? Isha now was all for her pulling out. “I was one of those saying, ‘You don’t know what the people are going to do; I don’t want you exposed, I don’t want to see you hurt again,’” she recalls. She had nothing to worry about. Williams walked out to a standing ovation that lasted into her warmups. At first Oracene was wary, wondering, Why are they being so nice? But Serena’s turn to conciliation made her mother take stock. “She needed that, and I learned that I need a bit of that, too,” Oracene says. Isha started crying. When Serena pulled off her headphones before the warmup and heard the cheers, she cried too. It was a terrible match, full of nerves. Williams, back on the court where, half a lifetime ago, she had beaten Graf to claim her first significant title, won 7–5, 7–5. The crowd stood again and cheered when Williams packed up and walked off. It’s an old saw that a nation gets the president it deserves. Maybe the same goes for its champions. No other active U.S. athlete rules a sport the way Serena Williams rules hers, and few reflect our era better. Is she polarizing? Has she, at times, been her own worst enemy? Well, we are an angry country now, disdainful of consensus, with hard divides between right and left, black and white, rich and poor, immigrant and native, millennial and boomer. 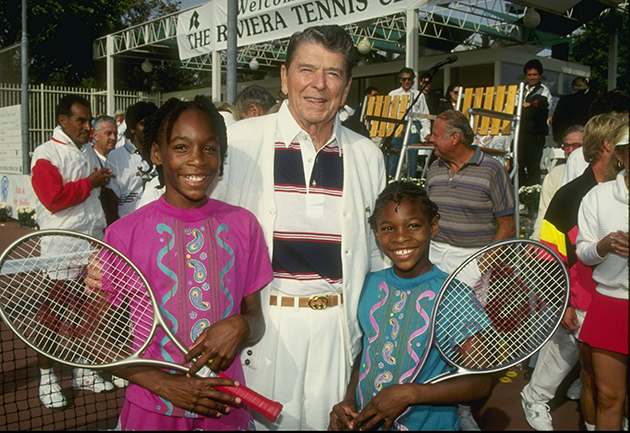 But the promise of opportunity remains, and who embodies it better than the poor black girl who rose from the streets of Compton, Calif., to high tea at Wimbledon—accompanied by a sibling nearly her athletic equal? But she’s determined to make a difference. In October, Williams guest-edited Wired magazine, which published her essay urging Silicon Valley to hire more women and minorities. “To those of you involved in equality movements like Black Lives Matter,” she wrote, “I say this: Keep it up. Don’t let those trolls stop you.” In November she gave a Q&A before 1,200 students and faculty at the University of Pennsylvania and said she felt cowed by the example set by black activists of the 1960s. So Serena is trying, all right, but it’s vital to note that her college civil rights course is an elective. Her required course is Kinesiology 100; the former business major is now premed, she says, taking online undergraduate courses through UMass and looking to focus on “nutrition, holistic medicine and healing naturally.” Day to day, identity politics battles for attention with family, tennis, her clothing line and an unlikely galaxy of people spinning in and out of her orbit. The entourage? Williams’s coach is French of Greek extraction, her female agent and live-in bodyman are white Americans and the 64-year-old guy who is her fitness trainer is also white. Until this year Williams’s physio was an American-Korean-Canadian, and her hitting partner, as close as a brother, was a Serb-German. Her romantic history involves a mix of white and black men; recent rumors have Williams bouncing between the rapper Drake and 32-year-old Reddit cofounder Alexis Ohanian. Good luck nailing down her type. A $203,000 Aston-Martin sits in the driveway. In a few hours she’ll jet to San Francisco and her soon-to-be-viral showdown with the cellphone thief. She talks about bunking up, possibly, “at Sheryl’s.” As in Sandberg. They met in December 2014, after Williams read Lean In, Sandberg’s best seller about women leaders. Williams tweeted that Sandberg was the celebrity with whom she most wanted to have dinner; Sandberg reached out. Soon after, there they all were at a Florida seafood restaurant: Williams with a friend and Sandberg with her two Harvard degrees, $1.3 billion net worth and tech executive husband, Dave Goldberg. Sandberg, used to self-promoters, was struck by Williams’s curiosity. She kept asking questions. She wanted to know all about technology. “She’s incredibly smart,” Sandberg says. 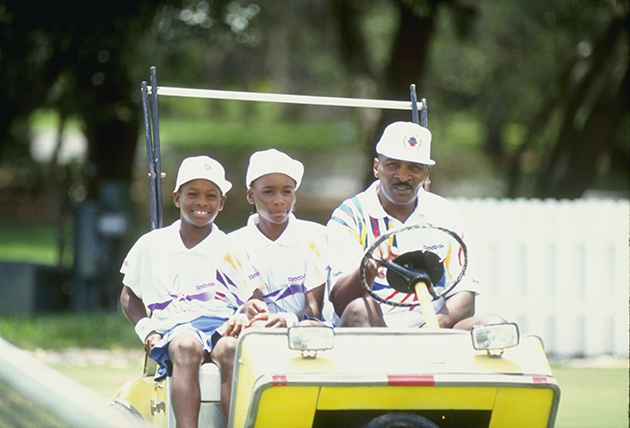 In early August, just before turning out the light, Williams told the children the Indian Wells story. She spoke of the hurt she felt from the crowd. She spoke of her vow never to return. She spoke of how you try to take life’s bad things and make some good of them, to let go, to move on, the same way you try to overcome the senseless loss of a sister or husband or dad. Did it help? With kids, you never know. “I thought the way she told it was beautiful,” Sandberg says. ​One Friday in mid-November, Williams walked with her usual near-plodding gait onto a court in the Los Angeles Tennis Center at UCLA. The other courts were empty. Students hurried past, staring at phones. It was only 9 a.m., but the sun had the court surface well heated, and Williams moved to a small patch of shade beyond the lines. She dropped her tennis bag, plopped on the ground and began to stretch. 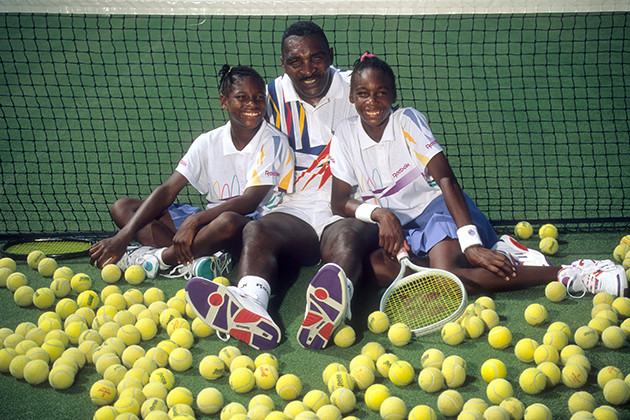 Years ago, when Williams was in optimum shape, she used to run the 21⁄2 miles to the courts from her home in L.A. Drivers hurtling by on Sunset would do a double-take—Hey, wasn’t that. . . .?—but by then she was gone. Today, though, her hitting partner, former Ole Miss All-America Robbye Poole, picked her up in his rental. Williams hasn’t played much lately. In early September, Williams suffered one of the biggest upsets in tennis history, losing her U.S. Open semifinal to 43rd-ranked journeywoman Roberta Vinci 2–6, 6–4, 6–4. The Grand Slam quest was dead, just when it had seemed assured: Flavia Pennetta, who like Vinci had never beaten Williams, was waiting in the final. Tennis fans, not to mention those who like tidy narratives, felt cheated. Right knee trouble in Indian Wells had forced Williams to withdraw before the semis, derailing a cathartic title run, and now history laughed at her in Flushing Meadow. Her season had everything but closure. Then there was the shoot for this week’s SI cover, a six-hour production involving a cooing crowd of handlers, makeup artists, designers, assistants, wardrobe advisers, two caterers, one aerialist for the hanging hoop thingy, a gold throne, a makeup trailer, a food tent and a supernova fashion photographer who said, “I love it!” A lot. They played Drake once or twice. Williams sang along. But the next morning, in the quiet at UCLA, it was just Williams and Poole. She wore tights, ankle braces, a visor, no makeup. “Know your lane,” she likes to say. “My core is tennis.” Some girls peeked into the court, giggling, and yelled for a photo. Williams didn’t answer; Poole said, nicely, “Not now.” Then Williams stood at the baseline and hit her first forehand, easy, accompanied by a long, break-ending “Ohhhhhh.” The clank of heavy machinery echoed from the construction site next door. Williams hit 20 strokes, harder now, then bent over and stayed that way a good 15 seconds. After a bit she moved forward, sliced a nifty backhand volley. Four large UCLA football players were watching; word had gone round the training table that Williams was working. She didn’t notice. She stood at the T fielding Poole’s forehands, netted a volley, brought the offending racket hand up to her face and berated it. Now Poole stood at his T, and they pelted volleys at each other, the ball never hitting the ground—14, 16, 22 straight. It looked so easy. The game makes Williams miserable, and it makes her shine. As soon as she stepped off-court, her walk slowed again. Poole ran to get the car. One of the football players, a linebacker, lingered, and Williams politely said hello and asked a few questions, all while hoisting an unwieldy box of tennis balls and edging away. She knew what was coming. In seconds, teenagers were closing in from every quadrant: snapping photos, asking for selfies. She managed to be warm and cool at the same time, to stop and keep going. But when she reached the sidewalk outside the gate, Poole wasn’t there. A woman, 18 maybe, appeared at her elbow. “Serenanicetomeetyou,” she began, then had no idea what to do next. Photo? Autograph? Hug? “Oh,” the woman said, and then turned and raced away. Williams cocked an eyebrow, shifted a hip. The box of balls was getting heavy, but she didn’t seem to mind. Standing in the sun on a street corner, unrecognized at last, she seemed to exhale—to settle—in a way that she couldn’t on stage or film set or camera. Poole rolled up, his little silver Nissan covered in dust. She couldn’t help but grin.